Royal Oak, Ireland: Walsh Whiskey Distillery is very proud of the achievements of The Irishman – Single Malt in winning no less than four awards at the 2018 London Spirits Competition, including the overall ‘Spirit of the Year’ award from over 470 entries. The triple-distilled, small batch, malt whiskey, also won ‘Whiskey of the Year’ beating several Scottish malts in the process. In addition to a Gold Medal award, The Irishman – Single Malt also took ‘Best in Show from Ireland’. The London Spirits Competition judges spirits on three criteria: drinkability, value and appearance (to include packaging). Commenting on the awards, Walsh Whiskey Distillery Managing Director, Bernard Walsh, said: “We are naturally delighted as the London Spirits Competition is among the most prestigious and hotly contested awards programmes. The proposition behind all our whiskeys is to offer very high-quality whiskeys at an affordable price. The Irishman – Single Malt is truly a rare breed, being a triple-distilled, Irish, single malt. 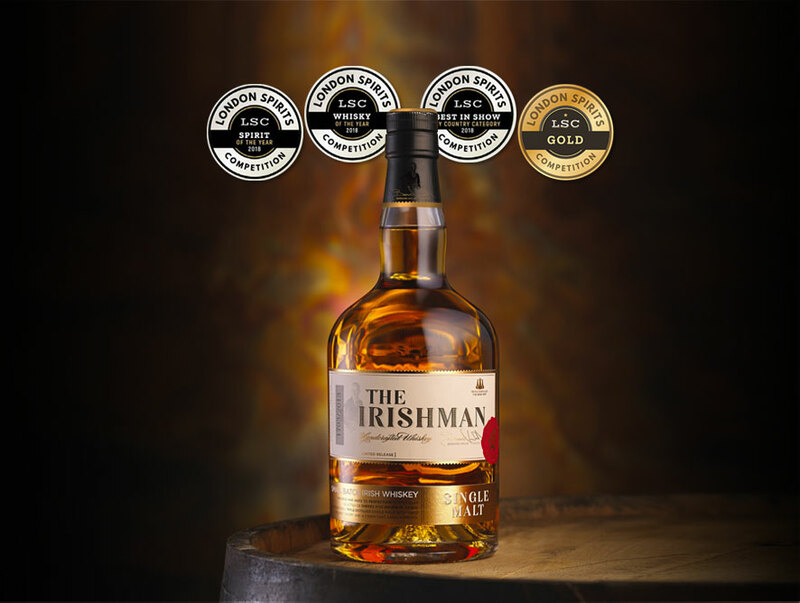 As the judges have already discovered, it won’t disappoint.” The Irishman range also includes The Irishman – Founder’s Reserve, The Irishman – 12-Year-Old Single Malt, The Irishman – 17 Year Old Single Cask Single Malt and annual Cask Strength finishes. The Irishman – Single Malt is triple-distilled and aged in Oak Bourbon and Oloroso Sherry Casks to give exceptional flavour and complexity. Each batch is limited to a maximum of 6,000 bottles. Palate: Vanilla sweetness, granola, toasted almonds and honey, a little oak, digestive biscuits, apricots, and a hint of cocoa. Walsh Whiskey were recently awarded Irish Distiller of the Year 2018 in Dominic Roskrow’s The Wizards of Whisky Awards. They also picked up GOLD for The Irishman Founder’s Reserve and Writers Tears Copper Pot.